There is a place I like to go to on Saturdays, and it’s a little second hand bookstore called Sultana Book Store. It’s located inside Peace Centre on Sophia Road, a walking distance from Dhoby Ghaut MRT station. I chanced upon it in my first week of Singapore back in April 2011, and have always been back since to find books to add to my collection. There is a great write-up by Gintai on the owner and history of the store, but here I’m going to talk about why I love spending my Saturday afternoons holed up in this place. As you can see from my pictures, the place is filled to the brim with books. 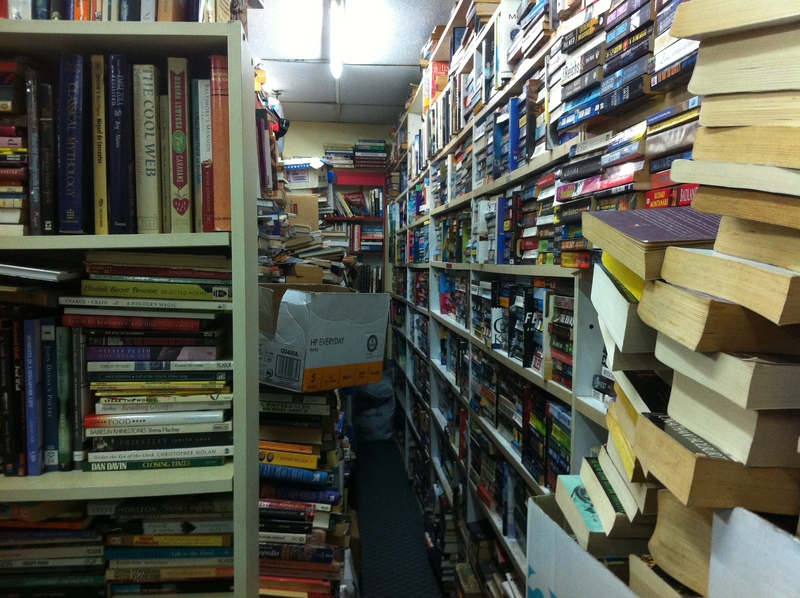 Its floor to ceiling is insulated with paperbacks, magazines, travel guides, comics, self-help books – anything you can imagine. 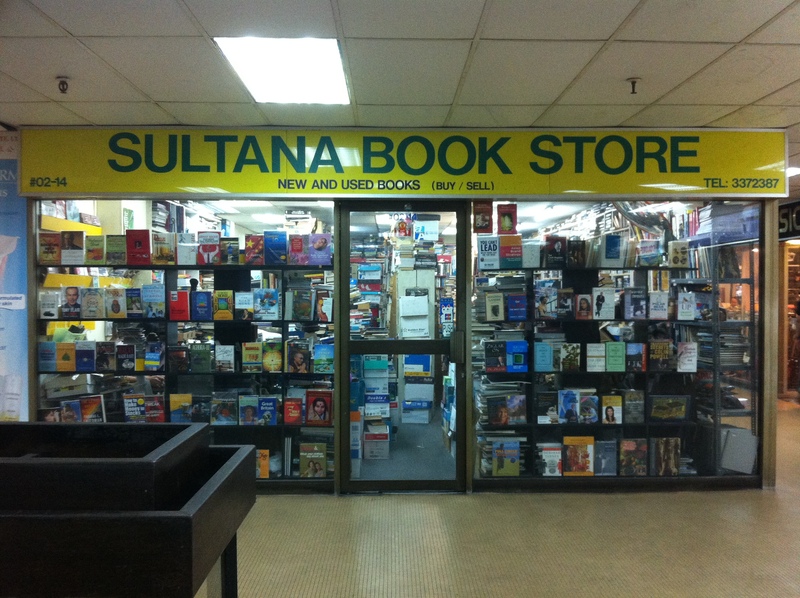 Sultana Book Store specialises in vintage and out-of-print books, so if you’re looking for something out of the ordinary, this is the place to go. 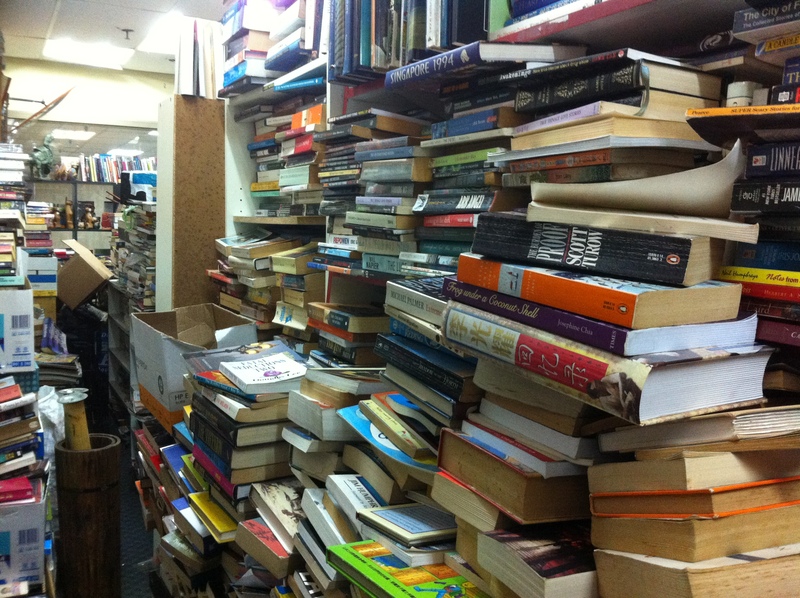 However, going in for a browse is like looking for a needle in a haystack. If you have a specific title in mind, ask the owner Mr Kwok. He is a walking catalogue who can tell if you he has the book, and if he does, knows exactly where it is. On my last visit on Saturday 21 July 2012, there were so many books that I could hardly manouvre myself, and I am a medium-built Asian female of about 5,4”. One pull at a paperback and I risk being buried under an avalanche – the crumbling piece of a Jenga block, only with lots of dust and pulp. Even though I’m allergic to dust, I love to spend my Saturdays here because it is my secret hideaway. It is so thrilling to rummage through the chaos, and find that gem of a title I’ve been looking for. For those who eat, breathe and die books, this is a place of refuge. For me, it is an escape from organised life and forced creativity. Peace Centre as a shopping mall is so different from the shiny modernity of Orchard Road, because it is so old, so dingy but yet so authentic and full of character. And I cling onto this because I fear they will take it away from me, and from Singapore. There are rumours that this place is closing soon, and then what will I have left, but the conglomerates like Kinokuniya and “artistic” stores like Littered With Books and Books Actually. I wonder if this is the same as the Sultana bookstore that i frequently go to during the 90’s. At that time it was located at the first floor of Paradiz centre. Unable to Email Mr Kwok I am searching for an East Malaysian jungle Air Strip Directory publish by A.I.D.U. Jaric Seletar in 1968/69 used by RMAF and civilian pilots flying in Sarawak Brunei & Sabah. 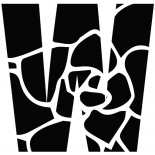 This entry was posted on July 23, 2012 by wanphing and tagged books, Singapore.